Salsa labels can adhere to any jar and contain just about any information or images you want, whether it's a company logo, a product description or even a custom graphic. Thanks to the experienced team at Lightning Labels, you can customize salsa labels for all your needs. These labels can be affixed to jars of all shapes and sizes and promote a new product or to give a friend or family member a unique gift. Businesses want to increase sales and attention, and packaging is the best marketing vehicle they have. Salsa labels can be used for products sold in a retail store or for homemade salsa, and with high-quality labels from Lightning Labels, it will be easy to stand out from the crowd. The experienced printing professionals at Lightning Labels will ensure your salsa labels are vibrant and won't peel off or fade in the refrigerator. Delicious homemade salsa can attract a crowd, but the salsa label is what will really make your product pop. Whether you are making mild or spicy salsa, Lightning Labels makes it possible to get as many or as few high-quality labels to match your product, and you won't have to break the bank. If you are trying to spice up a new salsa, the experienced printing team at Lightning Labels can help bring your ideas to life. Call Lightning Labels to Design Salsa Jar Labels Today! 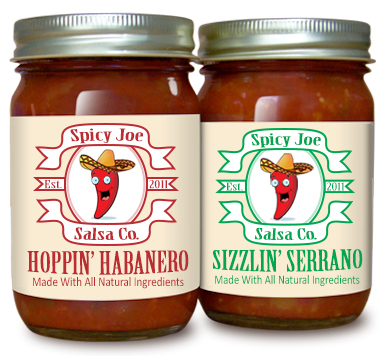 Call us at 888-907-3004 today to place your salsa jar label order and watch sales heat up!